Business Address: 8 Nguyen Huu Tho St. The Victory Hotel Hue is located in Hue making it one of the best hotels to stay at while in town. The Victory Hotel Hue features a wide range of modern facilities and services in its 22 well-appointed guestrooms and throughout the premises. The guestrooms are equipped with separate shower and tub, non smoking rooms, air conditioning, bathrobes, inhouse movies, desk. Hotel facilities offered at this Hue accommodation include 24hr room service, executive floor, elevator, laundry service/dry cleaning, restaurant, room service, safety deposit boxes, disabled facilities. 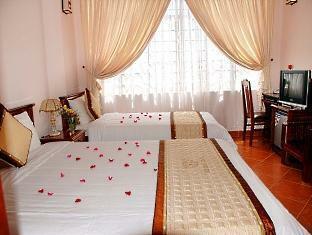 These top-class facilities are complemented to excellent services to meet the needs of visitors to Hue. To make your reservation at the Victory Hotel Hue via our secure online reservation form, please submit your visit dates.